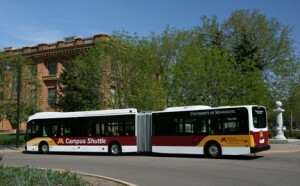 The University of Minnesota Campus Connector includes four 60-ft articulated Van Hool A300Ls. The Twin Cities campus is the oldest and largest in the University of Minnesota system serving more than 51,000 students. Its two separate campuses are five miles apart on either side of the Mississippi River, in Minneapolis on the west bank and St. Paul on the east bank. On a typical school day the University of Minnesota Twin Cities (UMTC) campus attracts 80,000 students, staff, faculty and visitors. Two-thirds of that number use transportation alternatives to come and go with 7,000 university students and 1,300 faculty using discounted bus passes. Once they arrive the ride is free on bus service between the two campuses, generating 3.8 million trips annually. This represents more than a nine percent increase over the previous year’s ridership. The campus health clinics alone generate more than 400,000 visits each year. Ranked among the largest public research universities in the country, UMTC does not forget its desire to serve an integral role in its own community. Transportation plays heavily in its civic contributions. In 1992 the university opened the transit way along the railroad right-of-way to connect the two campuses by bus. Anyone can ride between Minneapolis and St. Paul and the university pays the fare. The prime objective of the Campus Connector is to move students on and off as quickly as possible to minimize the time to board and exit before the next bus arrives — which brings up the point of the Van Hool A300L transit buses that serve the university so well. FirstTransit put 12 40-ft A300Ls with three doors and four 60-ft articulated units with four doors into service in January. The transit management company proposed a new bus fleet when it began its contract with the UMTC in 2007. Buharin says FirstTransit told parking and transportation officials it would purchase any make and model they chose. “We gave them a wide range of makes and models to choose from, along with prices,” he says. “They appreciated having options and were very enthusiastic about the selection process. We are proud of our partnership with the university and wanted to find a vehicle that would enhance its rapid bus model of intercampus transit. The Van Hool vehicles do this with a striking appearance that will look modern for the life of the bus.” He says the group even traveled to Oakland, CA to consult with AC Transit and see the Van Hool A300L in action. The Van Hool A300L is relatively new to this country. ABC Companies, Faribault, MN, the Belgium manufacturer’s sales and marketing partner for the U.S., brought the modern European design to this country last year. Utah Transit was the first to put it in service as the star of its new Salt Lake City BRT system, MAX. Globally, Van Hool has delivered this bus to 80 other countries and has an 80-ft, double-articulated configuration running in Brazil. The fully low-floor vehicle is essentially the next iteration of the Van Hool A330. The central midship engine placement on the older A330 required a higher floor at the rear of the bus. The offset engine location left of center on the A300L allows a full low-floor treatment front to rear that permits the extra door in the rear. Buharin says the UMTC officials were looking for efficiency as much as durability. In consideration of the brutal low temperatures during the winter months, the university also specified a self-service door system. The doors open only when needed and only for as long as necessary to keep the warm air inside from escaping. Andrews says the push-button door system is not a standard feature and ABC Companies worked with the Van Hool engineers to honor the request and ensure its operation on the fleet.